Managed service provider Intelligent Technical Solutions needed a more timely communication management process and to better attend to the company’s high volume of client correspondence and notifications. 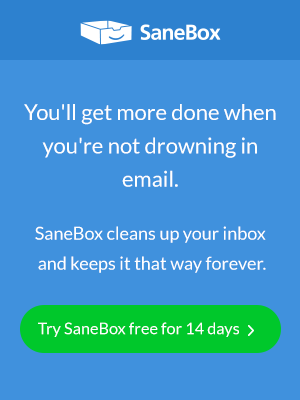 They found a solution in SaneBox. With a large client roster and a high volume of daily communication and requests from each client, the majority of ITS’ business happens over email. In addition to managing their internal notifications, ITS members also manage the bulk of their client communications via email. And what the customer wants, the customer gets. “We must do everything possible to accommodate our client’s needs, and when email is how they want to communicate, it’s our professional obligation to make sure we reach out to them that way,” says Sando-Doughty. With so much critical business taking place over email, it’s imperative that the ITS team maintain control over their inboxes. But managing correspondence within the company has proved to be a challenge. “Being able to manage, monitor and respond to all that high number of communications in a timely fashion can be a struggle,” says Sando-Doughty. Because the nature of their business is so timely, the ITS team needs to monitor their inboxes around the clock. But the sheer volume of communications, particularly non-urgent communications, was becoming overwhelming – and productivity was taking a hit as a result. Sando-Doughty knew he needed to find a solution to help his team get their inboxes under control and get rid of any non-urgent email so that all time-sensitive communications – like service notifications and client requests – were seen and addressed in a timely manner. He turned to his CEO for advice – and that’s when he found SaneBox. “I found SaneBox through a referral from our CEO, Tom Andrulis, who has been using it for quite some time,” says Sando-Doughty. Andrulis receives more email than anyone else in the company, so when Sando-Doughty heard about the incredible results Andrulis experienced with SaneBox, he was excited to explore it as a potential large-scale solution for the company. Sando-Doughty implemented SaneBox in his own inbox to explore the different features and see what benefit it might provide to his team. He was immediately impressed at the way SaneBox was able to filter his emails to ensure that high-priority communications got an immediate response – without requiring constant attention from him could drag him away from other important tasks. One of the features that proved to be a gamechanger for Sando-Doughty was SaneNoReplies. SaneNoReplies is a folder that automatically tracks all emails that haven’t received a response. The SaneNoReplies feature allowed Sando-Doughty to track which clients needed a follow-up and to make sure no critical communications fell through the cracks. The SaneLater feature, which moves all non-urgent communications to a separate folder, also allowed Sando-Doughty to focus on the most important emails and not get side-tracked by emails that didn’t need his immediate attention. Seeing the positive impact SaneBox had on his own inbox and productivity, Sando-Doughty began rolling it out to other team members to figure out the best way to integrate SaneBox on a company-wide level. Already, Sando-Doughty and the ITS have experienced a total change in the way they handle, respond to, and manage email, which has increased productivity and allowed the ITS team to better serve their clients. “[As far as the team goes,] It keeps them focused on what they need to do, minimizes interruptions from non-critical communications, and most importantly, it allows them to really own issues, being reminded as often as they need to be for follow-ups so that things don’t get lost in the day-to-day busy of our industry,” says Sando-Doughty. Ready to find out how SaneBox can help you take back control of your inbox, skyrocket your productivity, and get more done during the day? Get in touch today to find out how SaneBox can revolutionize the way you look at email—and ensure you never miss an important email again.